Due to the unexpecting nature of getting Carleton University in an odd manner, it will be difficult to do a “Live@Carleton” entry for the time being. I take my own apology for not getting to update the blog lately. Ok, here goes. 1) I chose three Canadian Studies classes with the same prof.
2) My Friday schedule is somewhat of an overkill because I got an 8.30am class and then another class at 2.30pm. I end at around 5pm, which feels depressing when leaving Carleton. 3)Two of Hodgins’ class, I am the “brave soul” who will present first with a few people. Though, kind of coincidental because I have to deal with it in both classes. Good thing, it is a group presentation, but still nervous about it. OK, ever since I started going to Carleton for several years, I’ve made up these types of themes when I had discussion group or class(starting in 3 year). Like PSCI3004(Political Parties & Elections in Canada), I realized that there were several people with Apple laptops and it made me smile. Oh yeah, for people in that class who use Facebook, I just want to say, YOU ROCK!!!!! 😀 It’s fun to have contacts and somehow talk about that site in class, which was pretty hilarious. I can’t name names, but you know who you are. I really want to get to know some of you better. I know I am somewhat “quiet” in class, but I make goofy faces whenever Hodgins says to everyone if they understood what he said or make some funny jokes. No comic picks due to not entering my blog lately. I don’t know what to say, but it has been a rough couple of days because I have been feeling ill again. I am fine now. 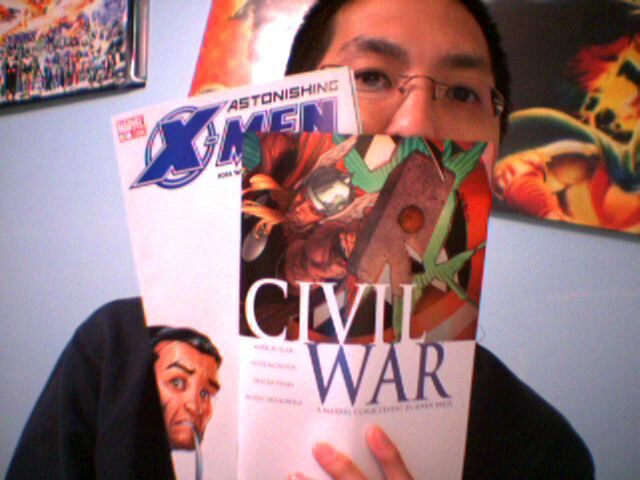 Well, an exciting Wednesday because I *finally* got comics in September. The pic shows part of what I got. I haven’t had a chance to keep up with the entries because I have been recovering from my cold and bad throat. It just hasn’t been a great week because of it. Finally changed my new look, got rid of my Roots jacket and changed it to another new Roots jacket. 🙂 Silly me. Just in case if some people I know from class who use Facebook, I hope you can leave a comment. Kind of funny that the prof said I acted like Kramer from ‘Seinfeld’ on Thursday. The only problem with me is that I never bothered watching Seinfeld. I’m pretty boring when it comes to certain TV shows that people watch. Another thing that is scaring me in Peter Hodgin’s two 4th year Canadian Studies classes is that I seem to be the oldest person there. Me being the 2-6, augh. I know I somehow look young, LOL. As for Facebook, I started using it in late August. Why? I have no clue how I got hooked on it. Liondance performances on the weekend. I am thrilled about it since a few guys are returning from vacation and work scheduling. Short Saturday Update: This will be a new part for my entries as it is will be my top picks in comic books. 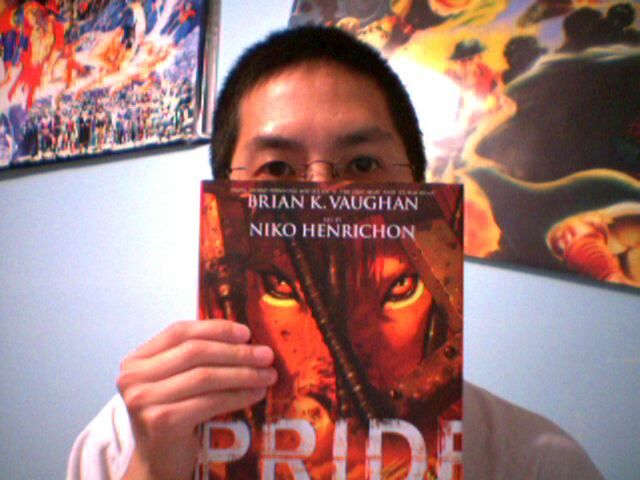 The book I am holding up is “Prince of Baghdad” from Vertigo Comics. I am still recovering from my cold and sore throat. Typing this entry in the library. I got Justin Timberlake’s new album (Clean version) added to my iPod, but I haven’t listened to it yet. I am somehow forgeting what day is it. This is not what I expected for today. I totally feeling like crap. Sore throat, stuffy nose and headache, what more can happen? What will I be missing tonight? CBC News: Tonight, WWE Monday Night RAW and Access Hollywood. It is great to be writing not from home. This is still S2E1 for this blog entry. Since I took a break and ended “season 1” for my blog, what I didn’t get to write were TV shows and music. I didn’t expect to hear some competition from Beyonce, Justin Timberlake, and etc. In my opinion, my choices for the Summer Songs of 2006 are Hips Don’t Lie by Shakira f/ Wyclef Jean and Crazy by Gnarls Barkley. As for television, I didn’t know that Fox made a head start when putting season premieres for Prison Break and House M.D. Oh yeah, the big talk last week was CBS Evening News with Katie Couric and Rosie O’Donnell on The View. I watched both and they seemed to be alright. Another show that has been in the news is Survivor: Cook Islands. I don’t know what to expect. The big fuss is the 4 tribes being separated by race sounds like it’s not a big deal. What to expect coming up? The Law & Order season premieres, including Special Victims Unit and Criminal Intent. What else am I anticipating on CBC? CBC News: The Hour. Almost less than a month away and I wonder what will Strombo put up his sleeve for season 3 of The Hour. Another show is Doctor Who Series/Season 2. I already watched it on my iPod video, but I am looking forward to rewatching it again. Finally back on, this is S2E1 or season 2, entry #1. More entries will be written later today. Due to the fact that I have succumb to a sore throat. I just hope to add more entries. To start off season 2, today is the 5th anniversary of 9/11. The attacks in New York City and Washington changed everyone because we are now in a reality where no one is safe. The destruction of the World Trade Center brought shock and sadness because it was once stood as the landmark of NYC. I should back by week of September 11.